MOZART: Violin Concerto No. 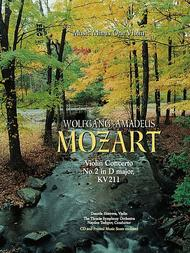 2 in D major, KV211 (2 CD set) composed by Wolfgang Amadeus Mozart (1756-1791). For violin. Instrumental Solo Part and 2 CDs. Published by Music Minus One (MO.MMOCD3167).ISBN 159615196X.This concerto is filled with Mozart's masterful writing, beautiful orchestration and a supreme sensitivity to the violin's sound, combining to create a wonderful contribution to the violin literature. Includes a second CD with a reduced-tempo practice version to help you as you learn the concerto.Includes a newly-engraved edition of the concerto on high-quality ivory paper; a digital stereo compact disc featuring a complete performance of the concerto with orchestra and soloist; then a second performance minus you, the soloist; and a second compact disc containing a full-speed version of the complete version as well as a special -20% slow-tempo version of the accompaniment for practice purposes. The concerto is voluminously indexed for your practice and performance convenience.